But when you’re doing so while holding down full-time posts elsewhere and with limited knowledge of legalities or finance, that step is a little bit more daunting! However, what has driven Patricia Barry-Murphy and Duncan Graham of Dundee throughout their journey is a shared dream, a passion for providing the very best dental care within a comfortable and welcoming environment. Partners at work and at home, the couple’s vision extended beyond the provision of everyday dental care, building on their significant postgraduate training. They dreamt of creating a spa, a place where patients would want to spend time, to transform their looks and their health, with treatments ranging from cosmetic smile makeovers, teeth whitening and teeth straightening to replacing missing teeth and facial rejuvenation treatments. This crucial stage in proceedings also marked the start of the couple’s business relationship with EQ Chartered Accountants in Dundee. Patricia commented, “Our relationship with EQ began a week after we discovered that the former practice was up for sale. We now consider them, and especially Louise Grant, a key part of the Vita team. Putting the compliance matters aside, including invaluable help with the business plan and projected accounts, EQ go way beyond the call of duty and are always at the end of the phone for advice and guidance. 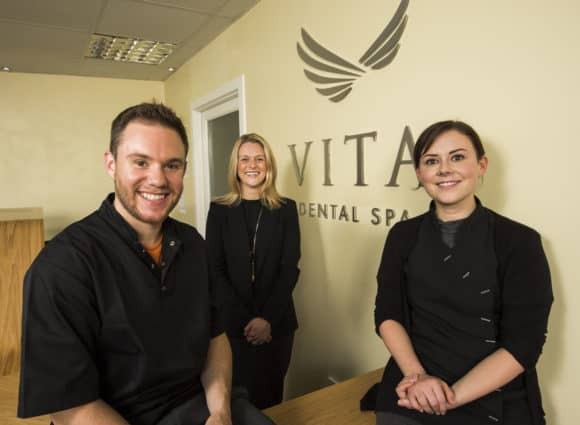 Having welcomed its first patients in October 2013, Vita Dental Spa now employs a team of seven, including three dentists. For more information, visit www.vitadentalspa.co.uk or www.eqaccountants.co.uk.